Build or buy? When manufacturers have sought new leaders, they have typically done both: grooming talent in-house and paying market rates for the best thinkers and managers. With the growing STEM (science, technology, engineering, and mathematics) shortage, companies will be harder-pressed to buy – and keep – top technical talent. Emerging and established leaders will command premium prices and field continual offers, increasing the likelihood they’ll make frequent job changes, taking their industry and institutional knowledge with them. As a consequence, manufacturers will need to build their talent pipeline, empower knowledge workers with the tools and intelligence they need to succeed, and provide professional development opportunities that exceed what competitors offer. This will be a marathon, not a sprint. 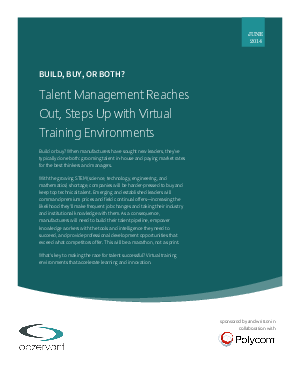 What’s key to making the race for talent successful: virtual training environments that accelerate learning and innovation.